Butterflies have a powerful cultural and historical significance and many meanings have been ascribed to them down the ages. In ancient Greek, the word for butterfly was ‘psyche’, which means soul, and the ancient Greeks believed that each new butterfly emerging from its cocoon was a human soul being reborn. The Irish believed butterflies were the souls of the dead, waiting to be transported to purgatory; while in China they symbolised long life and fidelity. The Japanese associated butterflies with youthful femininity and marital bliss, though considered them to be bad luck if they appeared in large numbers. Many of the hand-painted kimonos worn by geishas had butterflies on them and the creatures regularly feature in Japanese family crests. Native American Indians had their own ideas about butterflies; the Blackfoot tribe believed they brought dreams, whilst the Zuni tribe believed them to be the harbinger of summer. 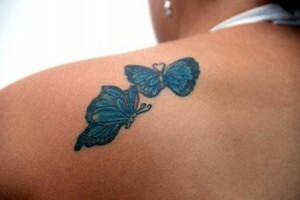 For women, choosing their creative butterfly tattoo designs requires great thought because of this symbolism. Apart from their undeniable beauty, these creatures also symbolise metamorphosis because of the transformation from rather ugly caterpillars, which become fat from overeating, into the exquisitely beautiful-winged creatures as they emerge from their cocoon. It is not surprising then that modern women can relate to this change in our society obsessed with size zero, anorexic super-models! To some women the butterfly might symbolise death and rebirth and it is a popular choice of tattoo for women who have gone through a difficult time in their lives and are looking for change or a new beginning. For other women a butterfly is simply an object of beauty and a manifestation of grace and peace. Butterflies are sometimes worn to signify that the wearer is a nature-lover, concerned with protecting the environment. Many women opt for the balanced look of an open-winged butterfly, which enables the artist to do justice to the striking colouring of the gossamer wings. The lower back area is perfect for displaying this design. 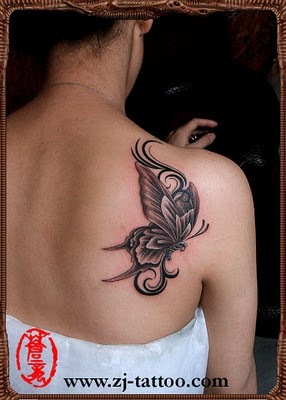 However, some women like to be different and choose a closed-winged butterfly and the most popular areas for this design are the shoulder or ankle. 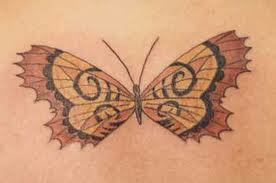 Along with ordinary butterflies, the Celtic butterfly design is also a very popular tattoo choice. But for true uniqueness, why not choose a combination of butterflies and other designs, such as angels, flowers, dragons, stars, crosses or zodiac signs? Just about anything you can imagine can be interwoven with these creative butterfly tattoo designs for a unique piece of body art that reflects your own special personality.